Rain, rain, and more rain. Rain in sheets. Rain driving itself along the hillside. Rain flexing its muscles. Rain duking it out with the sun. And it was Solar Disc Activation day. But it was also February in Peru. It was the rainy season and every travel guide I’d read said that rain could be expected part of almost every day this time of year. We had been fortunate thus far. It had rained during the night a couple of times but we hadn’t really had activities interupted by rain. 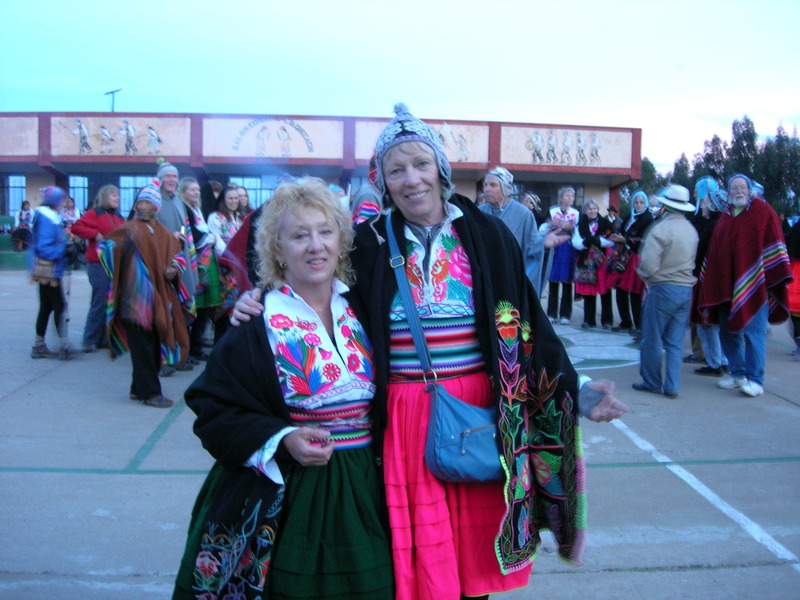 And now, during the culmination of all our activities and all our ceremonies–the very reason for being in Peru–was this day, February 14, 2010. And it was pouring rain. Sandy, Tim, and I put on our rain gear and made our way to our guest family’s kitchen hut. We weren’t in any hurry. We couldn’t imagine hiking up the hill to the Pachamama (Cosmic and Earth Mother) and Pachatata (Cosmic and Earth Father) temples with rain this fierce. But it was an important day and I did’t think I was the only one feeling a little unsure. There was nervous anticipation flowing through my veins. I had made it to the kitchen early enough to watch the women cook. And they were a marvel of cooking expertise. Using nothing but a simple earthenware stove fueled by wood, simple pots and pans, and basic food items, they made wonderful meals. Sometimes less is more and they were chefs masquerading as family cooks who were demonstrating that truth on a daily basis–and demonstrating it with both grace and pride for the visitors from the USA. We ate and waited for the rain to slacken a bit. We eventually set out to the town square, even though it was still raining llamas and vicunas. We were getting a later start than we’d planned, but we were committed and Juan Carlos led the way. At the gathering place, we found Jorge Luis and a few others. Most, it seemed, were waiting for the rain to ease up. We were on Peru time and Jorge Luis held great stock in flexibility. It would all work out in his model of the world–and, therefore, in mine. Jorge Luis gave those of us already there permission to go on ahead to the temples. We knew that this was a hike that could take some time (because of grade and altitude) and decided to start out. Sandy, Tim, and I were delighted that Juan Carlos was assigned to lead the way for us up the hill. And Juan Carlos took this responsibility seriously. We hadn’t gotten far when the rain slowed, then stopped. The sun came out and I put my rain jacket hood down and kept on going. We were among the first to arrive at the Pachamama temple. Half of the group would be meeting here; the other half at the Pachatata temple. Both temples were under the care of local chacarunas who would have to come to unlock them and lead the ceremonies. These temples represented sun and moom, male and female–both as separate entities and in marriage to one another. There was a visual, as well as auditory, hush to the place when we arrived, giving a magical quality to the place. It seemed poised, waiting. It felt grounded and it felt like sacred ground. 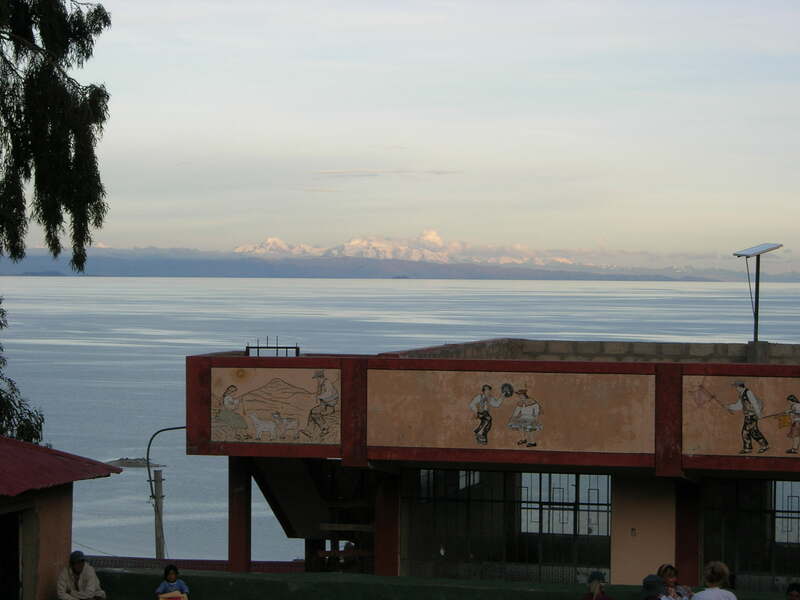 The view of the lake from the hill on which the temple stood helped place me in the cosmos and on the mother of all lakes, Titicaca. The temple itself was made of stone, standing nine feet tall or so. 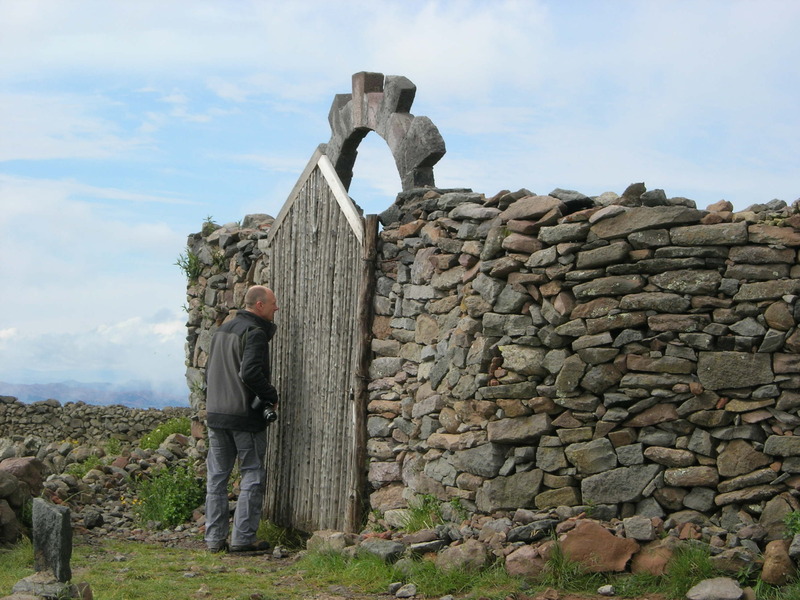 It had a simple wooden door that was peaked at the top. Above this, connected to the walls on either side, was an arch made of stone with “rays” or “teeth” that served as a kind of crown. People began to arrive in twos and threes, then in larger numbers. We spread out, getting a feel for the place. Most took photos. Many walked the grounds, got good camera shots, then found seats on boulders and looked out across the lake. Small pockets of people chatted, excitement coming from some groups and a hushed hum coming from others. Some just sat and meditated. I did some combination of these things. One moment I felt anticipatory energy stirring within; the next moment, a reverent calm swept over me. Jorge Luis arrived. We had all been asked to wear something white. He had two sets of clothes, one he’d hiked in, the other for ceremony. Whether he pulled off the first to reveal the second or put on the second to cover the first, I’m not sure. But he managed to become covered in white garb. I’d planned to be dressed in similar matter, but the rain nixed my plan to wear white cotton pants. Instead, I wore black nylon pants, which I knew would dry out quickly once it stopped raining, and a white cotton top, which my rain jacket would keep from getting soaked. I would have preferred to be all in white. Yet, there was meaning for me in the black and white attire. I had spent the first thirty-five or more years of my life understanding, then managing, then integrating the polar extremes in myself. A family history project in graduate school had revealed to me that I had internalized the kinds of polar extremes that existed externally in both my maternal and paternal lineages. Black and white garb was a good reminder to temper the polar extremes. It was also a reminder of my skill, both idiosyncratic and forged by shamanic training, at integrating the internal masculine and feminine. As I wandered the grounds, I came upon a key sitting on a boulder near the temple. It looked more like a hotel room key than the key to the padlock securing the temple door, but I was curious. I found Jorge Luis (doing his quick change) and presented the key, telling him I’d found it. I wondered aloud if it could be the key to the temple. Surely not. Still . . . I tried the key in the padlock and, as suspected, it did not fit. I looked at the key and considered putting it back on the rock. What if it actually was the key to a hotel room and someone returned, looking for it? Not very plausible and, besides, the key had a tiny bit of rust on it. I pocketed the key, deciding it was a gift to me from Pachamama. 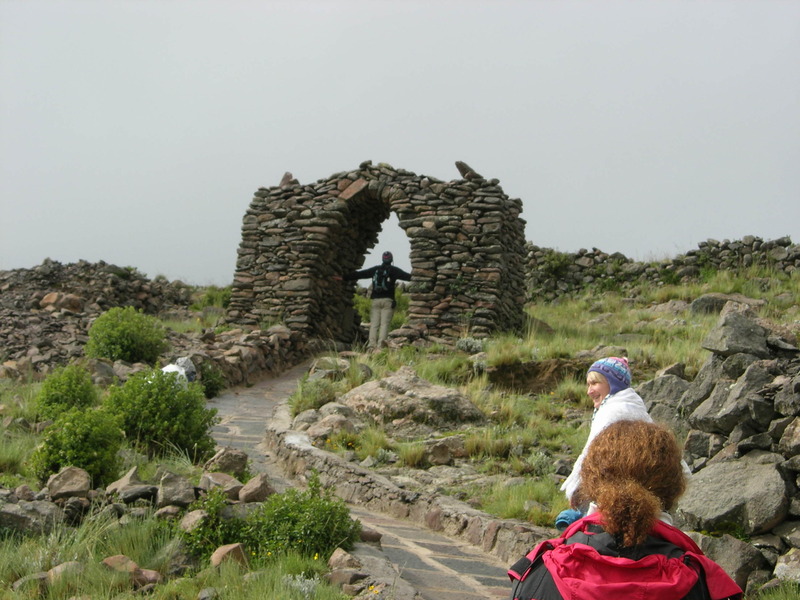 Jorge Luis Delgad called Amantani Island the island of love and said that it worked with the pink (munay) ray. I had to agree that there was something about the place. I felt relaxed and energized at the same time, as if something were about to happen and I was poised for it without needing to think or do anything, really. I could feel my heart reaching out to my host family, even though we shared no common language. They were a bit shy and I felt soft and respectful around them. After being served a meal, Sandy, Tim (my travel group companions also staying with my host family), and I made our way back down the hill and joined the rest of the group for more ceremony. We had taken part in fire, air, and water ceremony. Now it was time for earth ceremony and it would be led by don Mariano, Jorge Luis’s teacher. 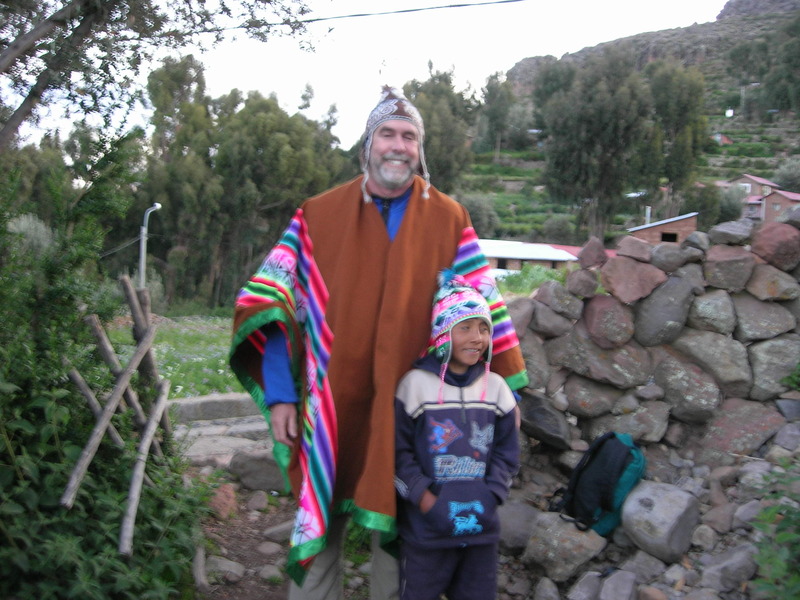 I gravitated towards the Peruvian shamans. I was learning. The Peruvian shamans always managed to find the best place to sit at ceremony and they seemed to do so effortlessly. Perhaps they had some sense about the land that guided them. Or maybe it was just about comfort. I didn’t know, but I was learning to follow their lead. Only a person or two separated me from don Mariano and I noted, with a bit of amusement, that he carried some of his shamanic supplies in a North Face pack. It was very much like the odd pairings one experiences in dreams. In the sleeping dream state, I might find myself making a dinner for long dead relatives in a mansion that seemed to belong to me. 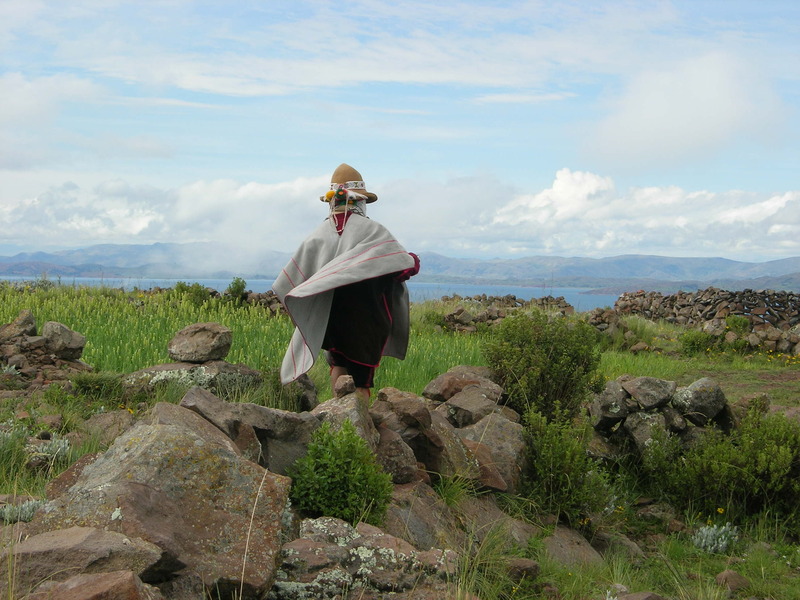 In this waking dream, the very alive–and very revered–don Mariano was pulling shamanic items out of a North Face pack on an island in the middle of Lake Titicaca. No sleeping dream could match that! But I was also amused because I had long been toting some of my own shamanic items around in a pack my husband brought back from Kosovo. I had needed something practical to transport white sage, a Celtic cross, my Om tuning fork, special stones from special places, candles, scented herbs and flowers for scattering, a rattle, and other items I used when I cleared and blessed homes. My drum and beater, large feather fan, my altar cloth, and many other items didn’t go into the pack, but some of the smaller tools did and while the pack had served me well, I’d always been a bit amused about it. I was not the archetypal image of the female shaman (or shamanista, as my friend Melisa Pearce referred to me) and my pack was certainly not the archetypal image of what a shaman would carry tools in. But here was don Mariano pulling shamanic tools out of a North Face pack. I loved that we shared that bit of practicality in our work. Jorge Luis spoke to us about earth energy and suggested that we practice looking at the distance between ourselves and a tree or mountain, then feeling the energy. I knew what he meant, or thought I did. I’d long practiced softening my eyes to see the auras of trees and I often allowed the tug of energy between me and a mountain or lake or tree or boulder to inform me and open me to communication with the spirit of it. 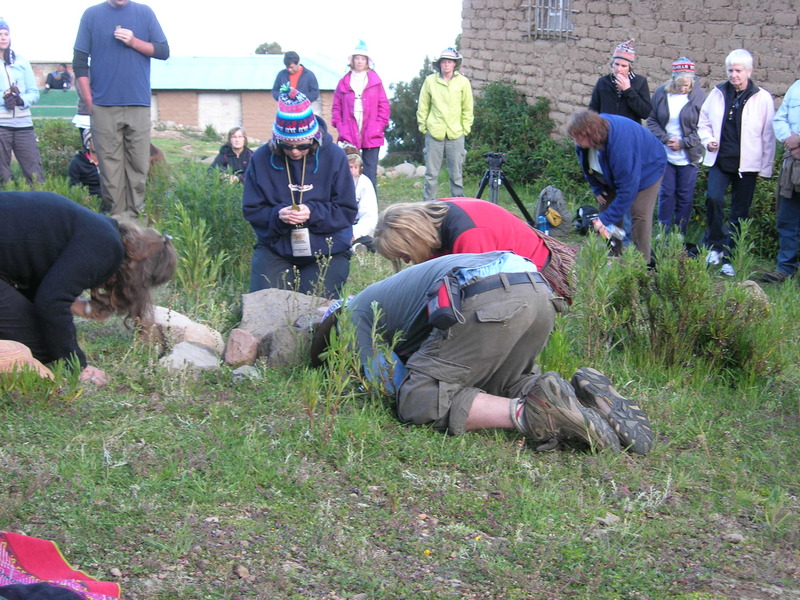 As with the other ceremonies, coca leaves were involved. A small fire pit (cold) was used in this ceremony. Four people at a time brought their k’intus (fan shaped arrangement of three coca leaves) to the pit, one person taking each of the cardinal directions. We then blew our intentions into the coca leaves, touched the earth, and put the coca leaves into the fire pit. It seemed a simple enough ceremony, but it was a powerful one for me. When I made my way to the fire pit and kneeled, I blew my intentions into the k’intu and was drawn to bend down and kiss the earth three times before placing my coca leaves in the pit. And as I did, my crown chakra began to vibrate. I was immediately in an altered state of consciousness. I could not give words to it in the moment, but my later sense of it was that I was feeling myself as a bridge between heaven and earth, in love with both and at the service of both. My crown chakra continued to vibrate for some time and, later, it began to vibrate again. Once the earth ceremony was complete, we all drifted towards a large square that seemed to serve as a local gathering place. There was a sense of waiting for something and I could guess what that might be: the dreaded dancing in costume. I was weary from the day’s activities and so were Sandy and Tim. We were also concerned about finding our way back to our host home. And the sun was sinking. I wanted to get the heck out of the Amantani Island version of Dodge before the festivities began. We made our way down the path, but didn’t get far before being hijacked by Paulo and Juan Carolos. We attempted to communicate through motions and words we knew they would not understand that we wanted to head back to their home. But Paulo had come bearing a pile of clothes and was intent on dressing us in them. 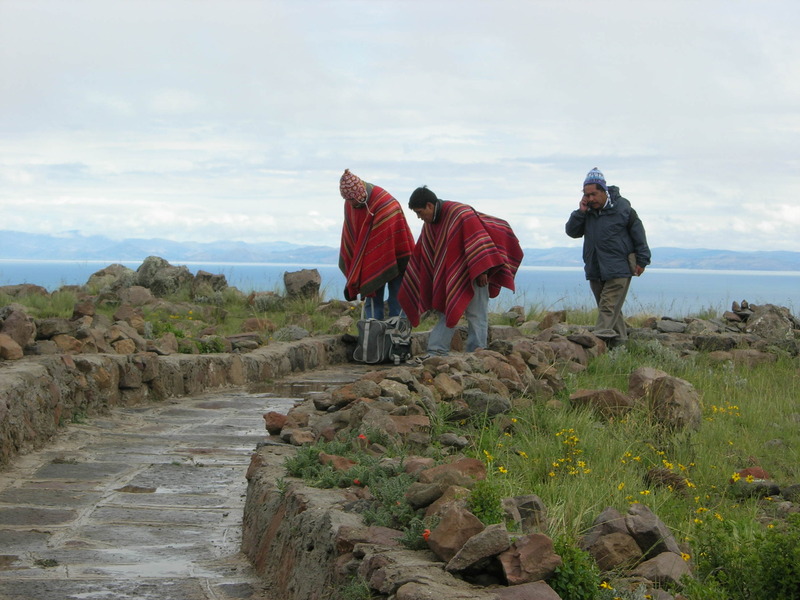 Let me be clear: The will of the Aymara on Amantani Island is a force similar to that of the tides or the wind or the sun, itself. We surrenedered and Paulo pulled traditional clothes–all of which appeared to bleong to members of her family–over our heads. These were not castoff clothes, but beautifully made and embroidered. Over my head went an embroidered blouse and it was accompanied by a bright green skirt. These went over the hiking pants and knit top I’d been wearing. Then Paulo wrestled with my body until she had two cloth belts tightly cinched around my waist. Interesting. I had already wondered how I would dance at this altitude. Now I saw that I would be expected to dance pretty much dressed in the Peruvian version of what Scarlet O’Hara wore to balls. Over skirt and blouse, Paulo placed one of the most beautiful embroidered shawls I have ever seen. We were led back to the square where we saw that we could relax because all of our peers looked, for the most part, as ridiculous as we did. The women in the group, no doubt, were as breathless in their cinched belts as Sandy and me. I was beginning to understand that breathlessness in women, while once highly praised, was actually produced by clothing that would not allow them to breathe. While I knew about corsets and the like, this had never really hit home . . . until now. I’m exaggerating a bit about the tightness of the belts and the quality of breathlessness I experienced, but I will say that I was happy that I work out on a regular basis–both cardio and weight resistance training–because it supported me in dancing wildly at an elevation that was challenging even for me, a Coloradan. As it happened, it was good training for the hike up the mountain the next day. But that, as they say, is another story.